At long last–the finish at Laugarbakki with my brother Michal and brother-in-law Brion. It has been one week since I completed my run across Iceland to bring attention to climate resilience, and I’ve spent much of that time recovering, replenishing calories with seafood, lamb, and skyr, and taking some tentative and recuperative steps on the trails, snowfields, and beaches around Isafjordur and Flateyri here in the Westfjords. The Climate Run was easily the greatest endurance challenge that I’ve ever faced. I covered 240 km (about 150 miles) in just under 45 hours of running (and a few hours of sleep), climbed and descended a total of 6,000 meters (20,000 feet), ran solo stretches of up to 35 miles, and consumed a steady diet of Pocket Fuel and Nuun, both of which turned out to be essential pieces of the endurance nutrition puzzle for me — particularly on the long stretch of tundra north of the Icelandic highlands. 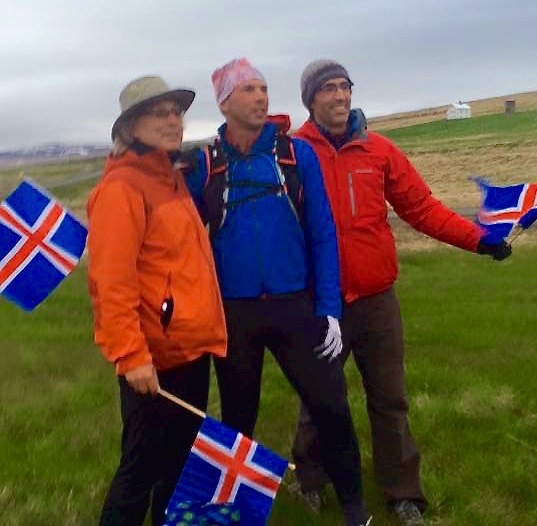 The project–from planning to preparation to completion–would not have been possible were it not for a dedicated support team here in Iceland: family and friends who provided logistical and emotional support, foot massages and wraps, delicious sandwiches and soup, and and-of-stage pacing without which I may well have curled up by the side of the trail many miles before the finish. I am forever grateful and humbled by all the help I got both on the ground in Iceland and from the project’s many sponsors and supporters over the past year. As I mentioned in an earlier post, the Climate Run route changed from my original plan to run the Kjölur Route to a route a little farther west across the Kaldidalur pass. 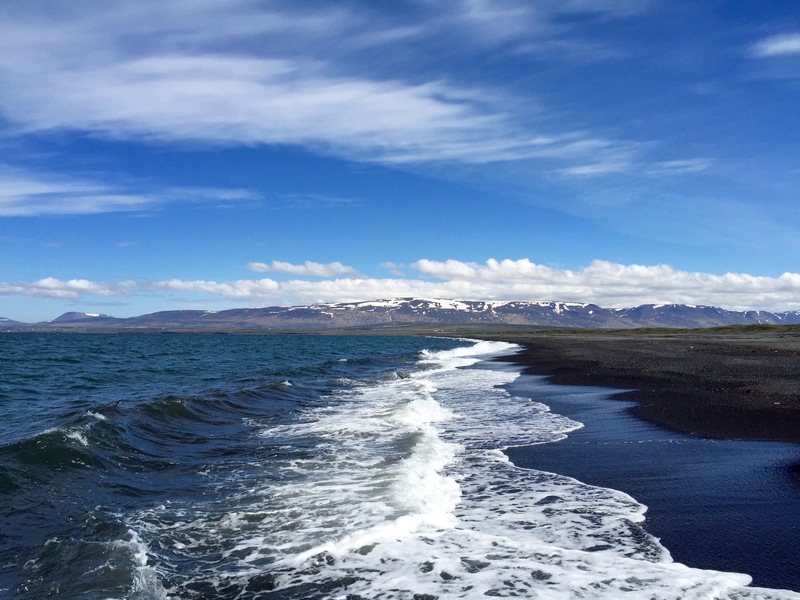 This route took me from the start on a beach of black volcanic sand near Thorlakshöfn, over the crater of the Hengill volcano, through the national park at Thingvellir, across the Kaldidalur pass, and over the Arnavatnsheði tundra and to Laugerbakki and Miðfjöður on the north coast. I am more than happy with the outcome. Although the route was a few miles shorter than originally planned, the terrain was more challenging and included more trail (and even off-trail) miles. As I write this post in the café at Borea Adventures in Isafjorður, I finally have some time to start to put together some thoughts about what I learned about resilience, running, climate, family, and community–all of which I believe are essential pieces of the broader ecological system of which we are always a part. I have already presented on Climate Run twice–once here at the University Centre of the Westfjords in Isafjorður, and once at the Arctic Encounters conference in Roskilde Denmark–and I hope this run and the stories, pictures and video (thanks largely to the tireless work of Jill Fineis Photography) that come from it are just the very start of an ongoing and powerful story of climate resilience and of our relationship to place and to one another.